Return to Website > Index > General > Bible Prophecy PreWrath Articles > Why Do People Believe Pretrib? Why Do People Believe Pretrib? The biggest doubt I have about the prewrath position is that its not widely accepted by true believers. When I simply read what Jesus and Paul and John say the message is obvious. Basically, in the world we will have tribulation (and as James says, "to count it all joy") and in the last days we can also expect tribulation. What baffles me is when Christians, like my beloved pastor, whole-heartedly believe in a pre-trib rapture and all the baggage that goes with it. My pastor clearly loves the Lord and preaches the gospel of salvation every Sunday. He is devoted to the Word, yet misses this and believes the LaHaye/Lindsey stuff. How is it that anyone who loves Jesus can be missing this truth? 1) The history of the development of the rapture positions, whose disfunctional growth created a fertile ground for the pretribulation view (see below). 2) The fact that, while in seminary, pastors-to-be have lots to study, from church growth to learning Greek, so the rapture is one of a seemingly infinite number of things to learn about. It's easy to overlook the inconsistencies in one view in the deluge of other information. Then, once they graduate and get their own churches, they become involved in the day-to-day affairs of their churches and it slips away unless they are somehow directly confronted with it. 3) The consequences of changing their view in a Christendom dominated by pretribulationism that severely persecutes anyone who defects (also see below). We had one formerly pretrib pastor turned prewrather in our Internet prewrath discussion group (http://groups.yahoo.com/group/prewrathonly) for awhile who agonized over whether or not to sign a doctrinal statement at his church that included a pretrib stand on the rapture. Apparently, they had to renew their signatures every year or so and, in the interim, he'd changed his view. Signing it would have required that he lie and not signing would have meant losing his pastorate in the church. Don't know what ultimately happened there, but there have been many, including Marvin Rosenthal who coined the phrase "prewrath" with his PreWrath Rapture of thChurch, who were forced to leave prominent positions when they changed their view. These pastors, ministry leaders, and professors are concerned about their professional lives — they can (and do) lose them. Where Does Pretrib Come From? Where do people get the idea that there will be a pretribulation rapture? Despite the widespread misconception that the pretribulation view was held by the early church, pretribulationism is a modern interpretation. Although there has been much speculation about the influence of the visions of a young Scottish girl named Margaret Macdonald, the development of the pretribulation rapture is generally attributed to John Darby of the Plymouth Brethren, who formalized the theory around 1830. Prior to this time, the return of Christ was seen as a singular event. Jesus would return to earth once, to rapture His Church, to redeem lost Israel, and to judge the wicked and rebellious world, and this was seen either as a midtribulational or posttribulational event. Darby was the first to formally theorize that Jesus would return in two stages: first in spiritual form to rapture the Church, then in bodily form seven years later to judge the world. This allowed Jesus to return triumphantly at Armageddon while keeping the Church out of the 70th Week. 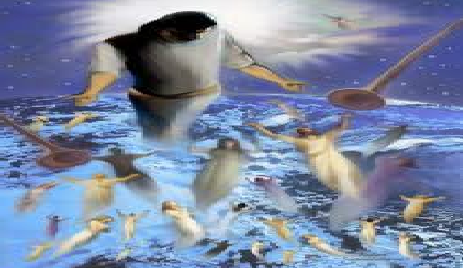 Classic Bible scholars, including John Wesley, Charles Spurgeon, Matthew Henry, John Knox, John Hus, John Calvin, Isaac Newton, John Wycliffe, and John Bunyan, among others, did not hold to a pretribulation rapture view. How did Darby's unusual interpretation of the scriptures win such widespread acceptance? In order to understand this, it is necessary to look at some of the issues surrounding the biblical scholarship of the time. The Book of Revelation was not written until about 90 A.D. Thus, in the early church, any budding end-times theology would have arisen from the gospels and epistles. It is only John's detailed description of the seal, trumpet, and bowl judgments—written more than three decades later—that allows readers to place Jesus' coming in the timeline of 70th Week events. When one considers only the gospels and epistles, a posttribulational rapture is the most reasonable interpretation, and indeed, the writings of the earliest church fathers indicate that the infant church was posttribulational. By the time Revelation began to circulate, clarifying the fine points of prophetic timing, the first century church was in the midst of dire persecution, and as John Walvoord has pointed out, such studies took a back seat to the very real tribulations of the day.